Our sturdy support stands are constructed of 3" square steel tube legs and 2" square steel cross bars. 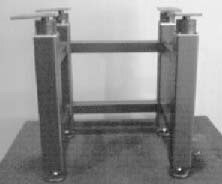 The standard support stand has leveling feet that are height adjustable +/- 1 - 2 inches. Locking casters or leveling casters are optional. For applications requiring a passive isolation system for use without compressed air, the vibration isolation canisters provide convenience as well as isolation. The VIC CANISTERS are inflated to 60PSI maximum and are available for loads from 100 Lb's up to 4800 Lb's. The canisters are mounted to the support stand and the Optical Breadboard is attached to the canisters with a rotating mounting plate to easily align to the mounting holes on the underside of the breadboard. Workstations can be totally customized to your requirements. A motorized or manual height adjustable work surface or counter top work surface is also available.